Here is a showcase of a project for the Postal Museum London that Nott Office have manufactured and installed for Fit out partner RAP Interiors. Including :- Glass furniture, Hot Desks, Bespoke Metalwork and general Office Furniture. Rather than mounting dry wipe boards on your walls why not utilise the wall with full height storage with facieas made with dry wipe boards! Take a look at a recent installation and see the amazing and efficient use of space. Storagewall - White doors, graphite surrounds. Like what you see? Contact us for more info. Do your staff stare glumly at their PC screens? Do they complain a lot? Are they only going through the motions of working, or even worse, barely working at all? If so, it could be because the office in which they work is less than inspiring. While it is true that all offices experience friction at some time or another, because let’s face it, not everyone can get along with everyone else all of the time, it is also true that the working environment has a significant effect upon employees’ wellbeing. So how do you make your office more dynamic? You may not be able to do much about the outside of your building but you can improve the interior to better motivate your staff. Bring in light, natural light where at all possible, and get rid of dingy and dark coloured walls, replacing them with bright, light colours. Bring nature into the office with pot plants, or if the view outside is good, have window dressings that can open fully. Then set to work on the furniture, replacing old and broken desks with new ones that are suited to modern needs. But what about office furniture? Does this have to be dull and uninspiring? The answer is a big, resounding No! How can you create a fun and welcoming environment using furniture? With EasyOffice, that’s how. EasyOffice is a unique office furniture solution that allows you to choose how funky, how beautiful and how branded you want your office to be. The EasyOffice range features infinitely customisable desks, tables and storage units that can be enhanced with literally any type of design, from company logos to iconic views of cities. Remember that bit about bringing nature into the workspace? With EasyOffice, this is simple to achieve by using images of fields, trees, seas and skies on the furniture. Don’t create a workspace that looks the same as every other workspace in the world. 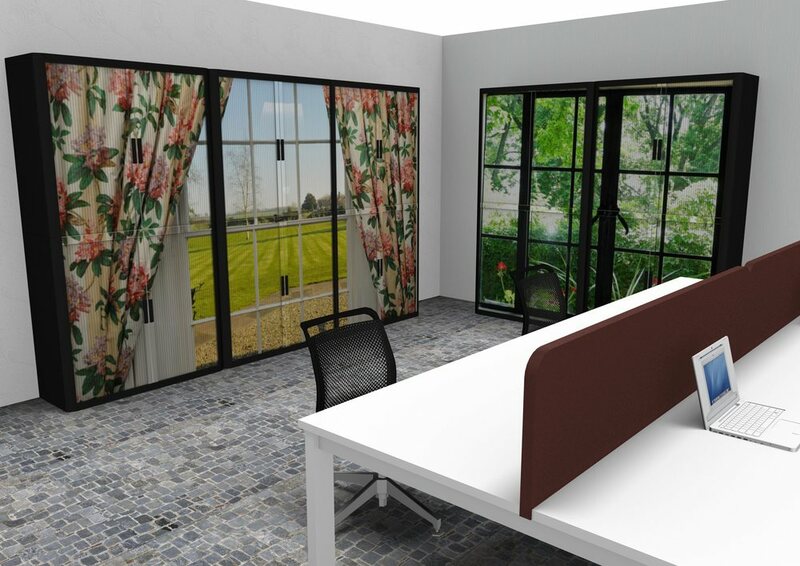 With EasyOffice, you can create the office you and your staff want to work in, an environment that is inspiring, visually stimulating and above all, fun.